Feel the magic of ancient symbols and timeless treasures when you choose gifts from Ireland, Scotland and Wales. Irish and Celtic jewelry - Browse their stunning collection of handcrafted silver jewelry rich with Celtic and Irish symbols. Celebrate your Anam Cara with a claddagh ring, your faith with Celtic Cross jewelry, or your love with Celtic wedding rings. Gael Song has one of the most extensive collections of beautiful and meaningful Celtic wedding bands available online. Celtic art for your home - Bring a touch of Ireland, Wales and Scotland into your home when you choose home accessories with traditional Celtic Cross designs, serene Celtic Tree of Life images or timeless elements from the Book of Kells. Choose cozy throws and elegant wall hangings featuring Tristan and Isolde, the Tree of Life or the spiral path. Accent your rooms with lamps, fireplace screens, vases and plaques embellished with the trinity knot, Celtic Cross designs, or elements from the Book of Kells. Magical Beings and Fairy Art and gifts - The realm of the little people and magical beings has always been a part of Irish daily life. Add these endearing Irish symbols into your home with everything from Elemental Fairy decorations to Dragonology books and jewelry. Unique gifts from Ireland - Dress for a Renaissance Faire, gathering or party in beautiful Celtic dresses or romantic men's Celtic attire. 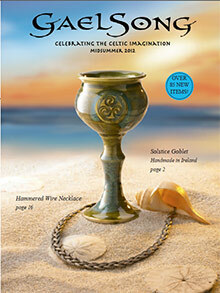 Dress your table with Celtic barware, accents and serving pieces. Or honor a special person with a unique piece of Irish Celtic jewelry, a Celtic Tree of Life journal, or a soft-as-a-whisper scarf. The choices are almost as unlimited as the people in your life. The best of Irish, Scottish and Welsh folklore, gifts, and home accessories are as close as your computer or the Gael Songs catalog. From an engraved Celtic wedding ring to a set of rune stones, you'll feel a bit of the Celtic magic in each item you select.